The person's who manage the condo properties were very helpful and friendly. The condo we stayed at was very modern and in good condition. The views of Gull Lake and June Mountain are the best in the area. The staff are exceptionally friendly and helpful. The Interlaken condos have wonderful views of Gull Lake and the mountains. I could sit all day reading and looking out the window--and have done just that on rainy/windy days. Everyone is always very friendly and helpful. We love Interlaken. The only place to stay when you are visiting June Lake or skiing June Mountain! 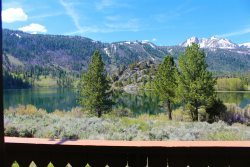 Best rental company in June Lake! Most helpful and friendly! As always you are terrific! Thank you for making our stay possible! Everything was easy and efficient, from booking, checking in and out and throughout our stay. The house was perfect for us and the location close to town could not be better. The house was clean and very well maintained. We were very happy with the house and location. Love the property, area, weather, clean water, air - - -etc. I had an excellent experience. Any time I call regarding questions of my reservations they were friendly and helpful. Always made me welcome. My family and I had a excellent experience in our stay in the property. The only one problem it was the refrigerator didnt keep the food cold until the 2nd day. But besides that it was great. We absolutely love Sierra, she is so professional, helpful and caring. Oh, and all the plants in the office are so beautiful. Unit 38 is great for a couple, nice amount of room, great view, corner room. Please, just don't rent it when we want it!